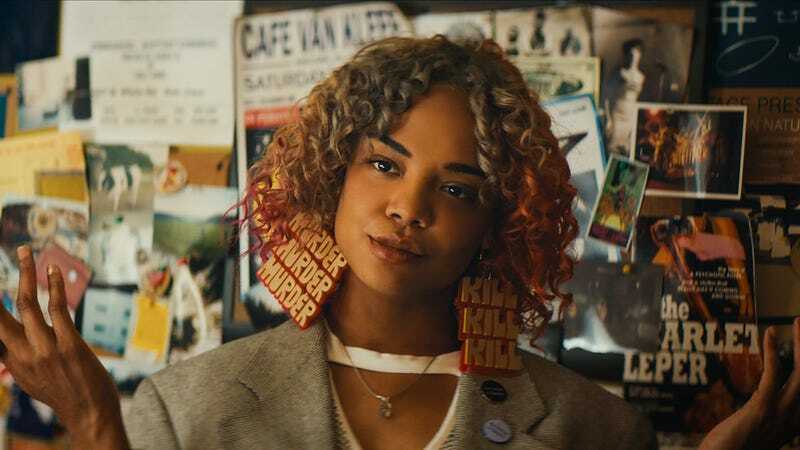 Tessa Thompson as Detroit in Sorry To Bother You. While Sorry to Bother You’s primary focus is on telemarketer Cassius Green’s (Lakeith Stanfield) path to becoming a power caller for a nefarious company, the film’s subplot about workers fighting to unionize is both timely and important in ways that can’t be quantified. The journey to the big screen for an indie film like Sorry to Bother You is a perilous one. While the movie’s concepts are fantastic and its message is culturally relevant, given the history of a country like the U.S., the only way that movies like it get made is with the financial support from studios like Annapurna that are bold enough greenlight projects the other, more institutional studios might deem too controversial or politically charged to be attached to. That fact is one of the many things that makes Sorry to Bother You’s message about the necessity of workers realizing that they’re stronger and better off as a cohesive unit with the strength of a union behind them so astonishing and refreshing. As much time as Sorry to Bother You spends with Cassius as he comes to realize that the company wants to make him rich is actually the embodiment of the evils of capitalism, the film also makes a point to express that it isn’t enough to merely recognize that the company one works for is more interested in the company’s bottom line over the well being of workers. Instead, it’s imperative that they come together as a unified front in order to fight for the respect, treatment, and wages they deserve. Because of the way films are traditionally funded, it’s rare to see a story that explicitly comes out condemning corporations as parasites whose wealth is generated at the expense of workers’ livelihoods. In those moments when Detroit (Tessa Thompson) and Squeeze (Steven Yuen) implore Cassius to see how crucial it is that he stands with his fellow RegalView employees as they organize, it’s impossible not to think about all of the financial deals that had to be made in order to make Sorry to Bother You possible. You can’t not think about all of the ways in which Hollywood, like most capitalist industries, has a long history of defanging works of cultural critique like Sorry to Bother You in an effort to make them palatable for an audience. It’s also impossible not to see that organizing is something that all employees should do, regardless of the particular industry they work in. For all the overtures companies make about employees being a kind of family, the fact of the matter is that at the end of the day, we all do our jobs in order to collect a paycheck and our employers pay us to do labor that generates money for them. You may like your coworkers and the company you work for but your employer is not your friend. They’re a means to an end and they see you in the same way. With that in mind, workers have nothing to lose and everything to gain by coming together and using their collective power to make sure that the people who need them to be profitable understand that they should not and cannot be taken for granted. For a number of reasons, that idea has become controversial and thought of as outlandish today, but Sorry to Bother You understands that this shouldn’t be the case. None of us really asked to be a part of the capitalist system that we’re all a part of, but it’s a part of the cards that we’ve been dealt. The system is broken to be sure but as long as we’ve all got to deal with it, it’s imperative that we advocate for and participate in organizations like unions that are expressly designed to make sure that at the end of the day, we’ve all got a legitimate shot at just being able to live our lives without fear that the system won’t drain us all dry before grinding us into nothingness.